Coinciding with Sustainable Happiness Week and opening for today, our school put on a showcase to connect sustainability with business. 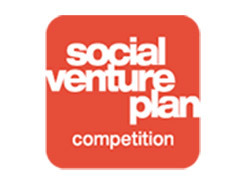 For the 7th consecutive year, Seattle Pacific University has enjoyed another successful Social Venture Plan Competition. In this competition, SPU students display their knowledge and commitment towards green practices in the professional world. FAQ’s about the competition state that “the term social venture describes entrepreneurial activities that address dual bottom lines: financial and social. A social venture addresses a felt social need while providing sustainable funding through a business activity.” All proposals had to present a product or service they would deliver, with a long-term focus on social and financial impacts. Usually these proposed companies focused on giving back to a local community with their profits. In this manner, the competition hopes to promote and perhaps even start more sustainable businesses. The plans introduced at the April 17th competition where SPU students voted for which plan should win the People’s Choice Award. A panel of official judges decide on first and second place winners based upon their projected finances and social impact, their amount of foresight in meeting potential challenges, and their research and analysis skills. Solid Ground Bamboo: a bamboo farm in Angola to provide employment for natives, supply a renewable resource, and close the poverty gap in a country with the world’s wealthiest city as its capital. Grounded: a sustainable coffee shop in Capital Hill partnering non-profit, ethical coffee growers. Sprout Organic: an urban agriculture business wanting to produce local produce and fish in South Seattle to employ refugees and cut down on food transportation. Housing For Hope: an affordable, self-sufficient women’s housing program in downtown Seattle. The showcase came at an auspicious time. In honor Earth Day today, the social venturers are promoting ethical business practices to maintain a sustainable earth. Each plan aims at improving our world by fulfilling a need, whether ecological or social, that the teams noticed. And, if nothing else, the Social Venture Plan Competition gives a perfect example of how people and organizations from all disciplines can work towards a healthier, more sustainable earth. Categories: Campus Events, Environment | Tags: Business, seattle pacific university, social venture, student competition, sustainable business | Permalink.